Scratches and dents in cars and other vehicles make them look used and worn. If you have a car or vehicle that you want restored its original color and shape, we can help. With us as their chosen auto paint shop, Gig Harbor clients can rest assured that they are being served by one of the leading auto shops in the area. 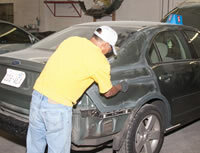 We provide a hassle-free experience when you come to us for car repairs and auto body painting. Cars and vehicles that get damaged after a collision need to be restored properly so that their original color and shape are retained. Novice auto paint shops will not be able to match the exact color of your color after repairs, making the car look worse than before. 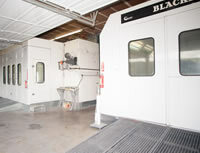 Using our computerized auto paint colors matching system, we are able to match the exact original color of the vehicle. We pay so much attention to car painting details that, after the repairs and auto body paint, even you will not be able to distinguish between the original paint and the newly-applied coat. This is what makes us the ideal choice for car painting services after a collision. You may need auto painting, not only after a collision or accident, but to refurbish your vehicle before selling or showing it off. This is where we can help. You can either get your vehicle repainted in its original color or even mix it up and get a whole new look with our auto painting colors. Contact Lakewood Auto Body at 253.581.0220 for collision repair and custom car painting and auto painting in Gig Harbor.